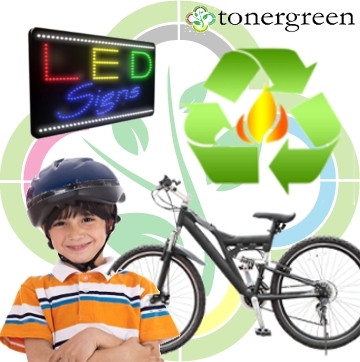 Bike to Work Day and National Bike Month - Fossil Fuel Conservation - LED Signs and How They Conserve Energy | TonerGreen - Eco-Friendly Toners from the U.S.
Did you know that the whole month of May is dedicated to biking? Yes, May is National Bike Month. This celebration was started by the League of American Bicyclists on the year 1956. This year's National Bike Month is divided into three celebrations: May 9 for the inaugural of Bike to School Day, May 14 to 18 for the Bike to Work Week and lastly, May 18, for the Bike to Work Day. So what's the idea behind the celebration of National Bike Month? The National Bike Month together with Bike to Work Week promotes bicycles as an option for commuting to work. This is an awesome opportunity to challenge yourself to commute by bike more often. Go-green supporters are, of course, in favor of this. Aside from being one of the simplest ways to burn up calories, biking has its own environmental benefits. Biking reduces the amount of pollution that is damaging to the environment. And by using bicycles as a means of transportation instead of cars, you help conserve fossil fuels which is a big thing considered that our resources are already running out of it. This is an undeniable fact considering how fast the prices of oil and gas are increasing time to time. And if we don't make a move, the time will come when there will be no fossil fuel left to sustain our daily needs, and think how horrifying that is. Biking is actually regarded as the most efficient way to reduce the usage of fossil fuel, but there are also other ways to conserve fossil fuels. You can start by not using too much plastic. If there is no other alternative then just recycle them, or reuse them the next time you go to the grocery store. Another way to help conserve energy and fossil fuel is to support green products, these are eco-friendly consumables produced by environment-conscious companies to help the environment. Tonergreen.com, the online provider of recycled toner cartridges and other environmental-friendly products, is one of them. We offer a selection of eco-friendly energy-saving LED signs which can save you up to 90% on your signage electricity costs. These LED signs contain no mercury like compact fluorescent bulbs or filament like incandescent bulbs and are the most energy-efficient compared to other sources of light. These LED lights also emit less "waste heat" because they use a higher percentage of electricity for generating light, and also emit little to no acidic gases which depletes the ozone layer thus saving energy and helping the environment at the same time. Saving the environment is a responsibility every one of us should be willing to do. Either by riding a bike, recycling a material or two, or supporting green products, you can help create a better future for the next generation.